Candidates in next year’s U.S. House and Senate elections in Texas raised more than $5 million in the first quarter from individuals. Most live in Texas. But a significant portion came from outside the Lone Star State, according to the Federal Election Commission. California led the way, followed by Virginia, Washington, D.C. and New York. As we noted earlier this month, candidates in next year’s U.S. House and Senate elections in Texas raised more than $5 million in the first three months of 2011 to spend on advertising, staff and other campaign items. 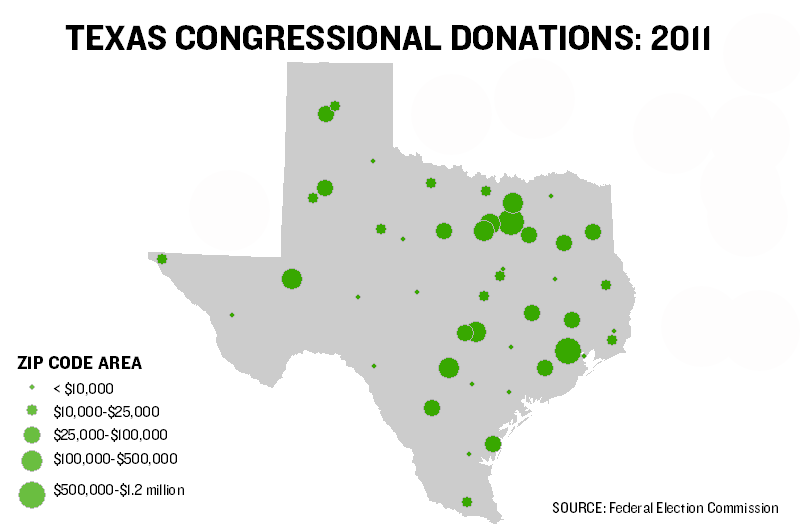 Most of the money raised from individual donors — not political action committees — was raised from Texans. But a significant portion came from outside the Lone Star State, according to detailed filings released by the Federal Election Commission. 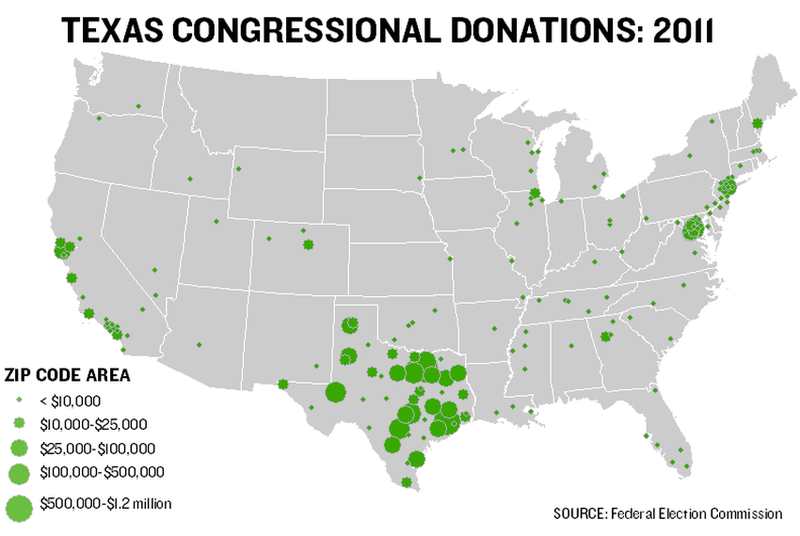 More than $700,000 — or one in seven of the dollars raised from individual donors — came from donors living in other states, largely on the East and West Coasts, the data show. Donors in California led the way, giving about $170,000, followed by those in Virginia, Washington, D.C. and New York. This national map above uses graduated symbols to display total fundraising by ZIP code prefixes, a grouping of contiguous geography based on the first-three digits of each code. Note the clusters of symbols in large population and power centers elsewhere. 208 MD 667,409 $16,738 Suburban D.C.
Of course, such fundraising practices are perfectly legal, and not unexpected, but they are still worth highlighting. Let us know if you have feedback or ideas for other data-related content, and be sure to follow @TribData on Twitter for updates. Some notes about the data: The fundraising totals only reflect individual donations, not other types of campaign reciepts, such as loans or interest on investments with campaign funds. Also, candidates aren't required to itemize contributions from people who give less than $200.